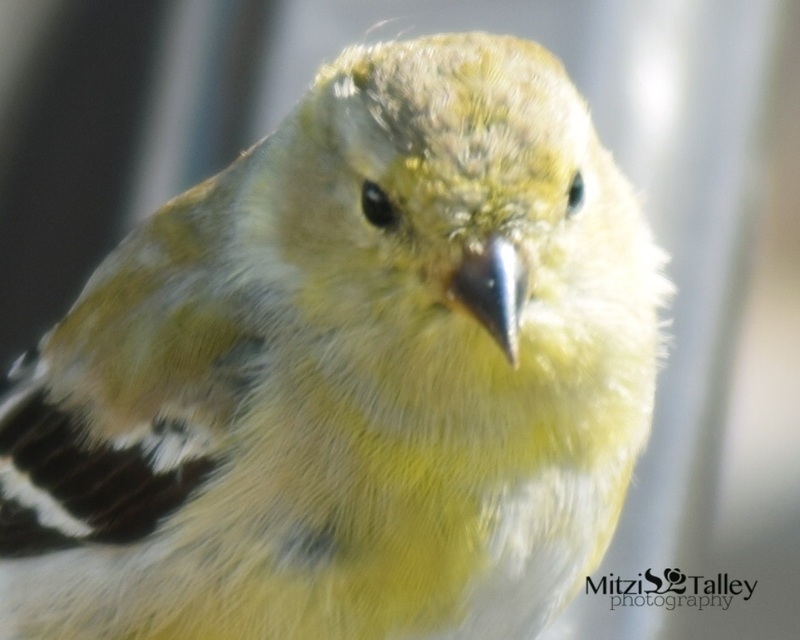 When you imagine the finch bird, do you picture one perched on a feeder hanging from a shade tree in your back yard? Maybe the bird has cinnamon red or brilliant lemonade colors and it flits from the branch to the feeder and then back again. Delightful entertainment on a lazy, warm afternoon. Or is the image a group of birds in a pet store cage? Finches darting from post to bar, filled with nervous twitches of excitement. Dazzling colors of sky blue, yellow and red could make a luminous sunset if not for being trapped in artificial fluorescent light. Most likely, either picture your mind produces, the same consistency of sudden movement, quick flight, brief time in the air and flying short distances is the common thread. The birds' frenzied and sometimes hectic search to fulfill the next immediate need or interest is what gives them their unique character. All of their movements are hurried and energetic. I like to think of their little personalities as nervous or frantic. *I can relate. * I am so this bird. GOD made finches the way they are for a reason. I was driving home one afternoon and it had been a difficult day. My brain was on auto-pilot. Aware of my surroundings and the flow of traffic, but my mind was cruising the roads of 'What-might-have-been Street' and the 'How-I-should've-tried Road' and all of the million little things that 'I could've-done-better Parkway.' My direction was heading to that dangerous bumpy, off-road detour EXIT "YOU ARE INADEQUATE." I had dreams of doing more and being a positive influence but it seemed it was something my heart wanted to go and experience but my brain wasn't buying the gas. So here's what happened next. I was on the winding street in our subdivision which wraps around the pond. There was no traffic, not even dog walkers or cyclists. On this warm, sunny afternoon, I was robotic on the last leg of my journey home. Suddenly this YELLOW FINCH flys from the right hand side of the car and almost hits my windshield. I slam on the brakes and watch it flutter and beat it's wings like mad. The feathers were doing reverse arm circles to give some distance between it's owner and the car. It redirected its wings like it was adjusting sails. It flapped and hovered in the center of my windshield and looked at me as confused as I looked at it. And from my lips fell, "You're the Frantic Finch." And almost like the bird had been given permission; it flew away. I watched it glide over the pond and then rest on a tree branch. It was supernatural. Magical. I think that experience was meant for me. I don't know what you believe, but it was a pure moment and it pierced my heart. I fell in love with the Frantic Finch that day and I believe she was a gift. Someone opened the door to the cage and one yellow finch hopped to the edge of the passageway and tilted it's beak to the sky in curiosity. In a moment of pure freedom, bliss and daring, she opened her wings, lifted high into the air and took flight. My heart beats as quick as the bird's with anticipation of what might be. I am living that moment where you hold your breath and wait for something amazing to happen. Just as the yellow finch that flew into my frantic life. Trusting faith and her own wings. Further and higher and out of the limits she created in her own mind. I am the Frantic Finch, perched on the threshold....daring to be free. Thank you for unlatching the door, dear reader. I am truly grateful. Psalm 124:7 - Our soul has escaped as a bird out of the snare of the trapper; The snare is broken and we have escaped. Psalm 55:6 - Oh, that I had wings like a dove! I would fly away and be at rest.